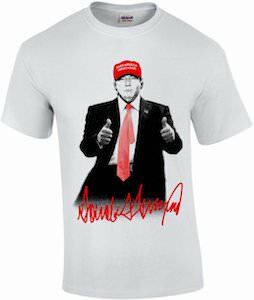 Maybe Donald Trump will be the next president of the United States Of America but it all depends on the voters and some of you out there think he is a hot head. And to make that message even more clear they now have Donald Trump For President hot sauce. This 5 fl oz bottle of hot sauce shows Donald Trump in front of the Stars and Stripes flag and below it on a blue background it says “Trump for President 2016”. And you can pick the hot sauce your like and you can choose between Chipotle Adobo, Cayenne Garlic, Jalapeño Classic, Fire Roasted Habanero and Red Savina Habanero. So let the Donald spice up your meals the way you like it. Are your political views a little more serious than some know it all rich guy that wears a bad wig? Do you stand for your country and don’t want to see Donald Trump run it? Well this is the perfect item for you, it can also be a very funny gag gift too. 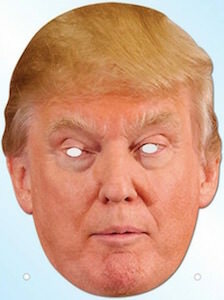 This is a roll of toilet paper that has the upper torso of Donald Trump complete with his facial features and of course do not forget the comb over haircut. 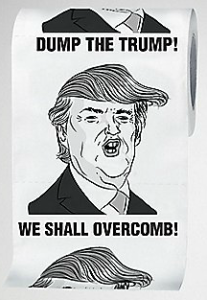 Along with the image of Donald Trump each sheet of toilet paper also has a saying like “DUMP THE TRUMP!” and “WE SHALL OVERCOMB!”, what a great way to show you are anti-Trump.